We wish to apologise for the QMplus issues we have been experiencing over the last few weeks. Intermittent performance incidents during peak times have caused the system to slow down and on a few occasions resulted in brief outages. We understand that this has been inconvenient and we are aware of the impact that this has, especially for some Schools who have had assessments in QMplus. This is not an acceptable service for our online learning environment and we have been working continuously with IT technicians and our external service providers to resolve this as a priority. It has not been a straightforward process as there isn’t a single root cause identified. A number of changes have been made over the past few weeks, each of which has provided some improvement. You can read more about how we are trying to address these issues in this article. Q-Review Personal Capture, affectionately known as PCAP, is software which any member of staff at QMUL can download and install on their computer. It allows you to create recordings of your screen, audio and webcam which you can then upload to Q-Review to be shared with your students. PCAP is changing. The new version of the software is called Universal Capture and includes an updated user interface and streamlined uploading of recordings. If you are a PCAP user, we recommend that you upgrade to Universal Capture as soon as possible. If you’ve never used PCAP…why not give Universal Capture a go? You will find more details on how to download and install the software in this article on the discontinuation of Personal Capture. We were able to record Dr Pettit’s presentation and have turned it into a number of short screencasts which you can view on the online grading with Turnitin article on the E-Learning Unit website. The ABC Learning Design method for developing technology enhanced teaching is now being used in many institutions in the UK and beyond. At its heart is a 90 minute highly interactive workshop where staff work with a visual storyboarding technique to develop designs for their teaching. 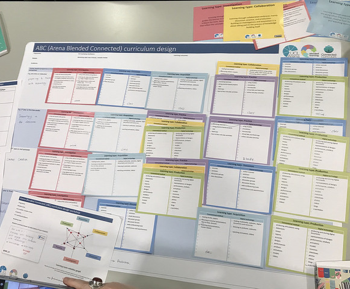 The E-Learning Unit have now run a number of ABC Learning Design workshops with a variety of staff across the university and they have proved to be very popular with attendees. We have also received some excellent feedback on how we can improve the format for QMUL which is being incorporated into our workshop materials. The workshops will be held in room 0.15 in the Scape Building on the Mile End campus. Workshop attendance is for groups. If you’d like to attend, we ask that you identify a group of colleagues who would come with you to work on your particular module. This might be those who co-teach the module, a teaching assistant, or just interested colleagues. Typically the format works best with groups of 3-5 people. If you would like to attend a workshop, please register your interest by sending an email to elearning@qmul.ac.uk indicating which of the dates you would be able to attend. If you are interested but cannot attend these dates, please let us know… …we will try to organise further workshops if there is enough interest. Getting Started with QMplus – Thursday 18th April 2-4pm – a hands-on session aimed at staff who are new to our online learning environment, or those who would like a refresher. Create, curate and share principles behind e-portfolios either to build your own portfolio or to encourage your students to develop theirs. These sessions run in the E-Learning Studio, room 0.09 in the Scape Building on the Mile End Campus. Please see our online booking system for more information and to book yourself a place. Drop-in sessions run every Tuesday and Thursday from 1-2pm in the E-Learning Studio on the Mile End campus for any member of staff who needs help with the use of technology in their teaching. There’s no need to book, just turn up on the day and a member of the team will be available to help. What are our users asking via The Helpdesk? Common issues on the Helpdesk in March included questions about student access to the archive and releasing of grades/feedback for Turnitin assignments. Read more in our common support questions article. If you need to speak to a member of the team about any issues you are having with one of our applications, we offer a telephone call back service. You can request a call back by calling the standard IT Helpdesk number, +44 (0)20 7882 8888, and asking for a member of the E-Learning Support Team to call you back. You can find out more about the service on the call back page on the E-Learning Unit website.